Adaptive radiations occur when a single ancestral species radiates into multiple descendent species as a result of adaptation to different environments or resources. Adaptive radiations provide perhaps the clearest evidence for the role of adaptation in shaping the diversity of life – think Darwin’s finches in Galapagos, Anolis lizards in the Carribean, figs and fig wasps, Hawaiian silverswords, and so on. The typical assumption of this model of evolution is that a number of empty “niches” exist and that organisms evolve and speciate to fill them, after which the radiation ceases. However, a number of alternative possibilities exist, such as the evolution of one species creating a brand new niche that favors the evolution of still more species – diversity begets diversity. These possibilities have been explored using a variety of methods. One method is to try to figure out how many possible niches are out there – and how many of them are filled. That is, do the 13 or so species of Darwin’s finch correspond to the 13 different resources to which finches can possible adapt? Stated another way, is the fact that marine finches and cave finches don’t exist mean that these niches are not accessible to finches or that finches simply haven’t gotten there yet? Questions along these lines are often explored by investigators attempting to guesstimate what niches are possible for a given taxonomic group, thus enabling estimates of which niches have and have not been filled by a given adaptive radiation. But how does one establish the range of possibilities? That is, how does one determine whether a hypothetical niche (marine finches) is or is not possible (i.e., accessible to the adaptive radiation)? A common route to this determination is to estimate the range of biomechanically possible morphologies and then determine how much of this range is filled by extant organisms. Unfilled morphospace then means the radiation hasn’t yet been completed – empty niches are still in waiting. Sometimes I fear that these endeavors are doomed to failure – because it is usually impossible for us to determine what realistic empty niches are out there but have not yet been filled. This opinion first crystallized for me on my first trip to Africa and was brought back to mind by this week’s trip to sample guppies in Trinidad. The key realization for me was that many organisms that currently exist would probably not have been considered possible if they hadn’t already existed. The most obvious examples of these impossible realities are situations where one or a few species are highly divergent in morphology from other organisms – with giraffes first bringing the point home to me. Giraffes are so different from other organisms that I would bet that we would never imagine they could exist if they didn’t already. Ditto for hippos and bombadier beetles and aye-ayes and emperor penguins and mudskippers and cookie-cutter sharks and gastric brooding frogs and hydrothermal vent organisms and so on. In other cases, it is a whole group that is so bizarre that we wouldn’t believe them without the proof staring us in the face. Perhaps most striking, no one imagined dinosaurs – at least not in the depth and breadth of their majesty – before they had been revealed by fossils. And I would place deep sea angler fishes in a similar place. These bizarre creatures suggest to me that many other morphologies, presumably suited for very divergent niches, still exist out there and have not been filled. Beth and Felipe catching guppies. The reason my trip to Trinidad brought this point back to mind was that a species exists there that is so bizarre as to challenge credulity, except of course for the fact that it actually exists. Imagine a bird that lives in caves (some other birds – cave swiftlets – also do so), feeds at night (some other birds – nightjars – also do so), has chicks that can be melted down to make oil, and echolocates (….). Yes, indeed, they echolocate. They use a series of clicks and screeches to help them navigate in pitch darkness both inside and outside of their caves. Bats do it, but birds? Bizarre. Unprecedented. Impossible? 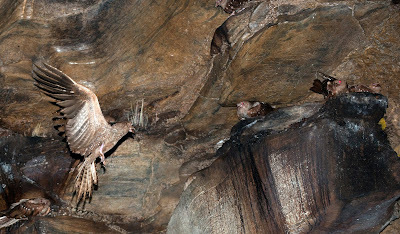 I had long heard about oilbirds and had even seen (mostly heard) them fly by while camping at night in remote rivers of the northern range of Trinidad – but never before in 13 years of visiting Trinidad had I seen them in their caves. But this was finally that year, with Felipe Perez leading me on a 2.5 hour hike up into the mountains to one of their (few) caves. From my field notes: We reached the cave well after dark and were coaxed along the last few hundred meters by an ever growing crescendo of loud clicks and screeches. We wormed our way down a tiny creek in a small canyon and into a boulder field that descended into the mouth of the cave. The cave was quite large and extremely noisy and a bit smelly and wet, with water dripping from the cave roof. It was not a horizontal cave like you see in the movies but rather seemed to go about 45 degrees down and into the depths – presumably having been wrought by the creek flow over eons. Along the walls of the cave were ledges that were full of screaming oilbirds. [Wikipedia notes: In Trinidad it was sometimes called diablotin (French for "little devil"), presumably referring to its loud cries, which have been likened to those of tortured men.] They would either sit there and hurl imprecations or fly back and forth in and out of the cave opening or around inside the cave. It was quite spectacular and I wasted no time in getting out the camera. The photography conditions were quite difficult, however, as it was pitch black and the oilbirds were mostly far away – so Felipe would hold both headlamps pointing at a bird and I would use a telephoto with a big flash, which – after much trial and error – took some decent photos. Although oilbirds were the main reason I was reminded of the difficulty of identifying the possible in evolution – and although they fit the illustrative point of a specific bizarre species very different from all their relatives – I can’t help but also mention a very different scenario that tells the same story on a much grander scale. 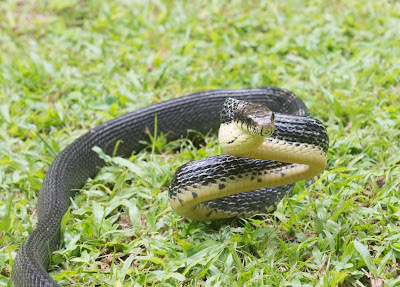 That is, an entire group that seems familiar to us only because of their existence – snakes. By this I mean that – if snakes didn’t exist – we might be hard pressed to imagine their existence, although some legless lizards get pretty close. 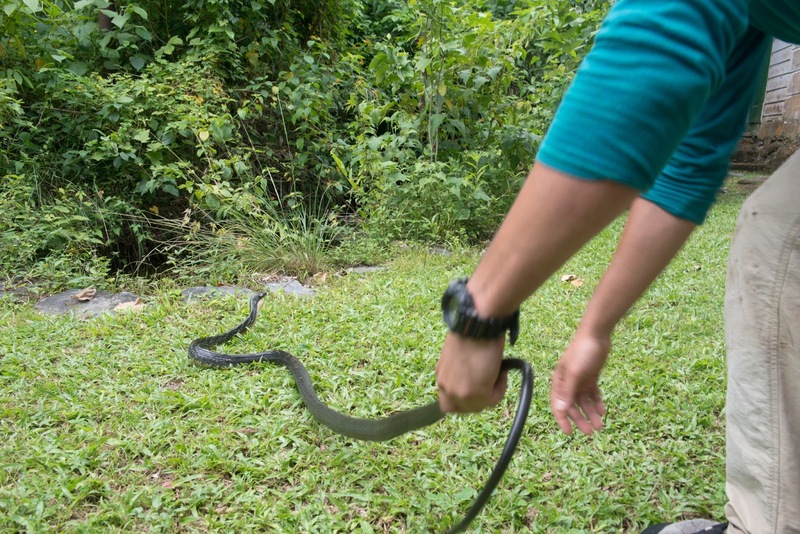 But, in reality, I am particular motivated to mention snakes – and to think about their strangeness – because of a recent encounter in Trinidad. 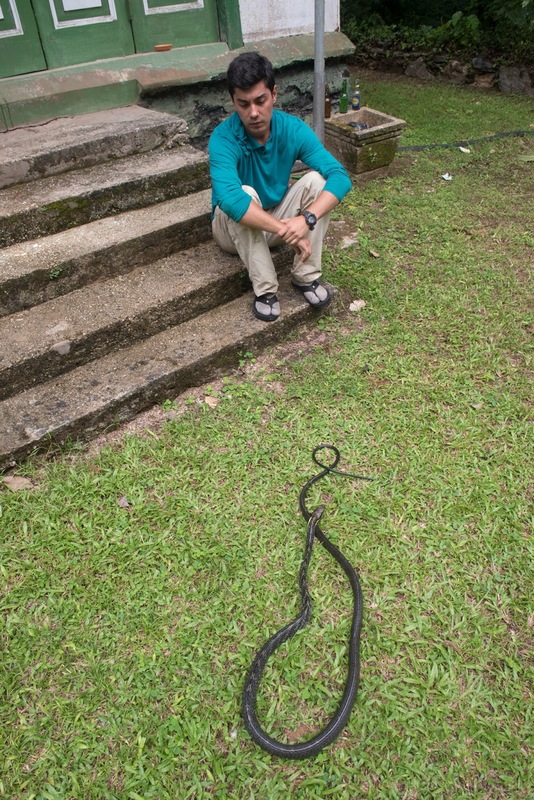 Fer-de-lance: the snake we most commonly encounter in Trinidad. 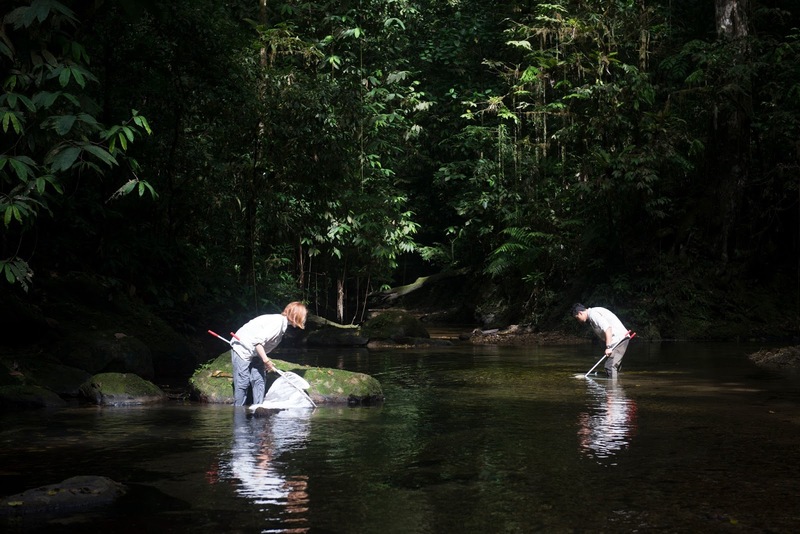 From my field notes: I was processing fish at the table in Simla (the William Beebe Tropical Research Station) and had just finished a tank of fish. I picked up the tank to take it and empty it outside and was walking out the door when “thump” something heavy fell in the area between the open door and the door jamb. 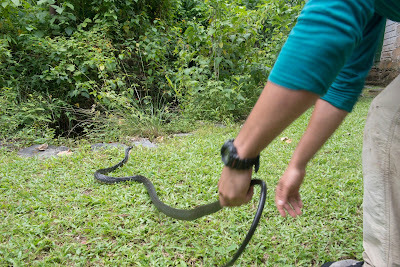 I looked quickly and saw it was a very big snake. Thankfully, I also instantly saw that it wasn’t a poisonous one – or at least not a poisonous one I was familiar with – so I just kind of backed off and called Felipe and Beth to come have a look. 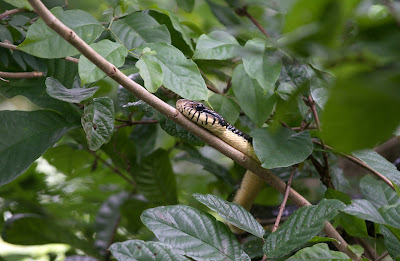 During this time, the snake, which turned out to be Pseustus sulphureus sulphureus, was slowly working its way up the door jam and higher toward the rafters of Simla. Felipe quite correctly pointed out that it would be good to not let it get too high above our reach or we would never get it – so I ran and got some butterfly nets to catch it. Felipe then engaged in a protracted dance with the snake to try to catch him in the nets, which he eventually did. I kibitzed and took photos and videos. After taking it outside, we let it go and it sort of hung around in some bushes nearby. We were confident its traumatic capture, handling, and release would convince it to depart. 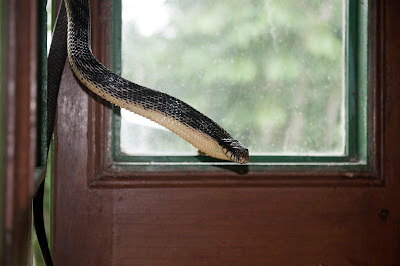 About 15 minutes later, I was sitting having lunch on a couch facing the open door when, what should I see but the snake slowly slithering back inside the door. This time it was my turn to take a stick and pick the snake up and deposit it farther away from the house. But, by this time, I was starting to think that maybe it really wanted to be in the house and that it would not be deterred. Sure enough, about 15 minutes later, Felipe found it right beside the house again. This time, we moved it into the trees a bit away from the house, just the sort of habitat where it should like to be. It stayed there initially but I was getting more confident that it would be back – so I kept an eye on it. In fact, I went and got my camera to take some more photos – this time in its more natural environment. By the time I got back outside, I could see that it was starting to move out of the trees again toward the house. So I started filming. As it got closer and closer, it changed direction and was heading right for me. Hmmm, this will be a good video, I thought. Then it came out of the tree not two feet in front of me – heading straight for me. A good video indeed! In fact, I could see that it was still heading toward the house, which was behind me, and the most direct route from where it was to the house was directly between my legs. I kept filming and, sure enough, it kept going right through my legs and toward the house. I eventually stopped filming because I could see it was about to enter the house through a small hole, so I grabbed its tail and it instantly whipped around and struck at me. Being at about waist height on some steps at that point, it definitely raised my adrenalin level. You lookin' at me punk? By this point, I was really enjoying the snake but also finding it quite distracting – I had fish to process after all. So at the end of this third encounter, I collected it with a pole and dropped it off a rather steep – if short – cliff lined with ivy. Although it clearly wouldn’t be injured, I figured it would at least get the idea that it might get injured if it stayed. It wasn’t that I was afraid of the snake or didn’t like it – quite the contrary – I just figured that it would be very distracting if we were having to keep our eyes open all the time while we were in the house for fear of stepping or sitting on it. Remember sitting on your house cat by accident, well this would take it to the next level. After this most recent encounter, I went back to work processing guppies, but I kept looking behind me toward the door and windows because I was still thinking it might be back. 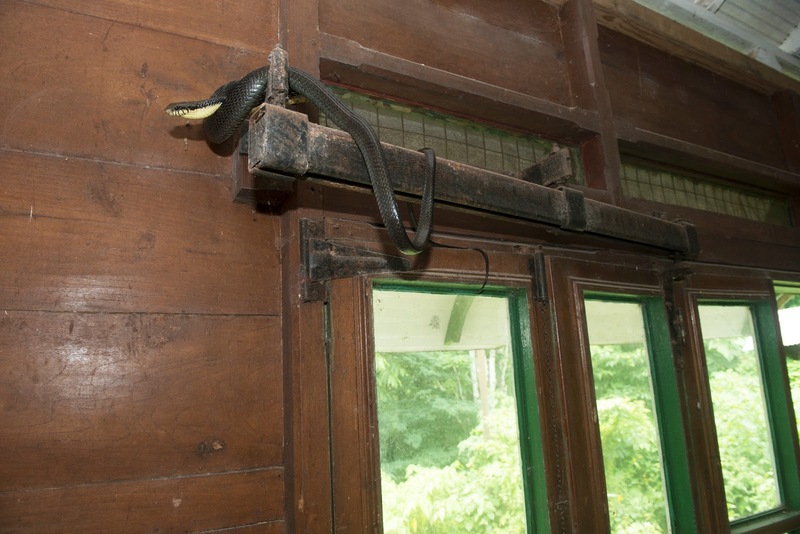 Sure enough, about 15 minutes later, I could see it climbing the outside of the house and then entering the house along the edge of the vaulted rafters about 3.5 m up. Then it proceeded to move along this edge. Well, I thought, we can’t have it moving up into the attic or down into our rooms – that would take the distraction to a whole new level, so I set out to corral it in the same way Felipe had done previously. But now it was about a meter higher than before, so I had to stand on a desk or table and reach way above my head with the nets trying to get the snake into the net. This I could sort of do – but only the first half of the snake – try as I might I couldn’t pry the other half off the edge – and it became rather exciting when it would turn around and coil up as if to strike – while being 1 m above my head looking down at me. As I didn’t succeed in capturing it, it turned around and went the other direction until it got to a new place where I could take another whack at it. Back and forth and back and forth we went in some bizarre pas de deux. Each time I tried to catch it, it would turn around and head the other direction. I would then sit down to process a few fish and, then, when it finally reached somewhere new where I could get at it, I would rush over, jump on the table (or desk) and try to corral it again. It eventually seemed to tire of this game and worked its way out of the house and onto the roof. That was it for that day but I suspect that the next visitor to Simla will have a similar adventure. 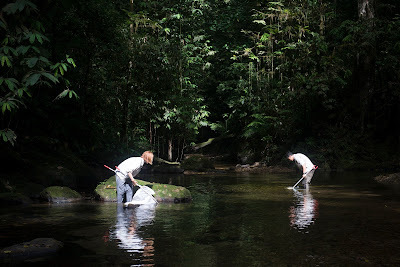 Another Trinidad oddity - the endemic Mannophryne trinitatis and his tadpoles. So, from snakes to oilbirds to dinosaurs to hippos to giraffes, it seems to me that the human imagination and even calculation is incapable of postulating the possible endpoints in an adaptive radiation. We either circumscribe the possible morphospace much more than the actual reality, or we postulate things that really aren’t possible no matter what. I am not sure where this leaves the study of adaptive radiation except perhaps to the idea that the best judge of what is possible is what already exists, with the caveat that this is almost surely an underestimate of what is actually possible. Adaptive radiations are indeed stranger than fiction.